Note: Because I’ve been spending so much time responding to my essay from last week, I haven’t been able to finish a new post for this week. So instead of just posting nothing, I would like you all to enjoy one of my personal favorites from the Anime Almanac archives. Originally posted on September 9, 2005. At first I was going to post a review of the live-action TV show entitled Train Man (“Densha Otoko”), but then I realized that doing so would not give this story enough justice. This simple story about a nerd turning towards the Internet for romance advice has become a phenomenon that is currently rocking the Japanese and American otaku culture. It is a representation of the geek and nerd lifestyle and where our hidden passions truly lie. I will take a look at the history of the Train Man, the kind of impact it has made in Japan, and just what makes it is so significant. In reality, Train Man started off in an Internet message board. The Japanese have a board called 2-Channel, and it is known as an epicenter for geeks and otakus. It has become a staple in the Japanese Internet culture, giving birth to online slang and extraordinary ASCII-based artwork that would make an American smiley face cry. I’ve taken the following from Wikipedia entry because I feel that it summarizes the Train Man story better then I ever can. Between March and May of 2004, an anonymous user posted in a thread for single men to decry their woes. His post detailed an event that had happened that day as he was riding the train. According to his account, he was sitting on the train when he noticed an attractive woman. Suddenly, a drunken man entered the car and bothered many passengers, who did not offer any resistance to his disturbance. This man then began to badger the woman, and seeing no one else coming to her aid, the poster took the risk of telling the man to stop bothering the passengers. The two struggled for a short time while the other passengers used this distraction to summon the conductor, who took control of the situation. This poster was an extremely introverted, socially inept otaku. Never having done such a thing before in his life, he was amazed to find that the woman was thanking him deeply for saving her from harassment. They exchanged addresses and parted ways. The poster, upon returning home, began talking with other posters in the thread and was nicknamed “Densha Otoko” (Train Man) for his bravery. A bit later, Densha received a package from the woman he had saved. This package, originally thought to be a generic thank-you gift such as one would buy in a drugstore, turned out to be an expensive tea set. Flabbergasted, the he turned to the 2channelers for advice; he was soon convinced that such a gift was too expensive to be a mere thank-you gift. Densha contacted the woman and began meeting her regularly, all the while posting updates and conversing with other posters. Following their collective advice, he got a haircut, purchased new clothes, and began to come out of his shell. After a while of seeing her, his personality had changed for the better and this culminated a few months later in his confessing his love for her. She accepted and when the 2channelers were informed of this there was a mass celebration; posts began flowing in congratulating the new couple, extravagant Ascii Art pictures were posted. A look at the original posts made by the Train Man on the 2-channel message board. Here, the online posters suggest that Densha take the girl out to dinner in return for the cups she sent him. It should be noted, however, that no one can actually prove that what the Train Man was saying was true. It could have all just been an elaborate fabrication from one man or even a group of people. But that still didn’t change the fact that people were hooked on this story. The media went on a frenzy with it, and so did the entertainment industry. Shortly after its conclusion on the Internet, all the message board posts were compiled into a single volume novel and quickly became a best seller in bookstores. From there, a movie was made and became one of the top films of this summer and is still doing well in the box office. In addition to that, a TV drama is currently airing on Japanese TV, which has been accepted quite nicely to our own fansub community. And to top is all off, there are currently four different manga adaptations being serialized in both shounen and shoujo magazines. Scenes from the Train Man TV show. It’s hard to ignore that this simple story has made a huge impact, but just why that? Well, first of all, it tackles the subject of the Internet world vs. the real world. People tend to have different personas for when they’re online compared to how they normally act. The Internet gives you the freedom to break past the shell that society has created for you, so you can express what you really think without feeling much pressure from your social status. The Train Man was a good person with the sole desire to love and find happiness. While he couldn’t do it in real life, he was able to easily dream and express his feeling on the message board. So his story is remarkable because his goal is to bring that Internet persona into the real world. As the viewer, you closely monitor his progress and eventually are rewarded that, yes, the two worlds can merge together successfully. Another factor comes from the people involved with this story. While the actual Train Man might have been a fraud, there’s no doubt that those who also posted on the board are real. They are geeks like you and me who come to the web to find information and share in ideas and hobbies. So the posts and suggestions that make up this story come from the real, honest opinions and life experiences of the Japanese people. Men would share their experiences with love and what they found to work best for it. Girls would talk about how they would like to be treated if the Train Man was pursuing them. The “characters” portrayed in the movie, manga, and TV show were actually real people just living out their lives. Even if you weren’t a part of the event as it was happening, there’s still the notion that it could have been you there talking to the Train Man and giving him your own advice. It adds a whole new level to reality TV. 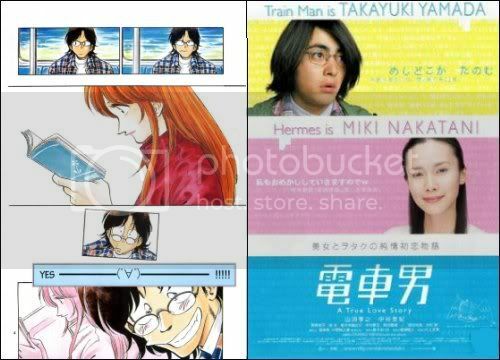 A page from one of the four Train Man manga adaptations, and the poster for the movie.. But it is the combination of those factors that make the Train Man the phenomena that it is. While many bill it as a real story, he is still just a fairy tale. A fairy tale that has been spawned through the collective hopes, desires, and imagination of the internet otaku culture. He is what socially inept men wish they could be, and the knight in shining armor that lonely girls wish would come to them. His story has won over our hearts because it is what our heart made. That is the magic behind the story of the Train Man. Since I first published this essay, three out of the four Train Man manga have been released in the US thanks to Viz, Del Rey, and CMX. I personally recomend the CMX version. The Tran Man movie was screened in US movie theators in 2006 and then released on DVD by Viz pictures. The orginal Train Man novel was published by Del Rey, but as I write in this reivew, was very poorly adapted into English. The TV show still goes unlicensed. This entry was posted on Wednesday, July 9th, 2008 at 6:59 pm by Scott	.